VMware vSphere 4.1 introduces a new affinity rule, called “Virtual Machines to Hosts” (VM-Host). This new rule is available in vSphere 4.1 DRS clusters in addition to the existing (anti) affinity rule, which is now called VM-VM affinity rule. The new VM-Host affinity rule provides the ability of placing a group of virtual machines on a subset of hosts inside the cluster. The new rule can very useful in blade system environments and for honoring ISV license requirements. Rules can be created to ensure that virtual machines run on ESX hosts in different blade chassis for availability reasons, or the complete opposite and limit the virtual machines to ESX hosts inside a blade chassis to optimize network speeds by keeping network traffic inside the blade chassis. VM-host are also very useful to fulfill the requirements of special ISV license models as well, for example restricting Oracle database virtual machines to run only on ESX hosts which are licensed by Oracle. The VM-host affinity rule differ from the VM-VM rule, A VM-Host (anti) affinity rule specify the (anti) affinity between a group of virtual machines and a group of ESX hosts inside the cluster, whether a VM-VM (anti) affinity rule only specify the (anti) affinity between individual virtual machines. 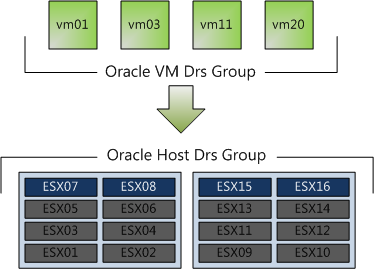 Virtual machine DRS groups and ESX host DRS Group are quite self-explanatory so let’s dive into the designations component straight away. Two different types of VM-Host rules are available, a VM-Host affinity rule can either be a “must” rule or a “should” rule. The must-rule is a mandatory rule for HA, DRS and DPM, it confines or prevent the virtual machines to run on the ESX hosts specified in the ESX host DRS Group. The “should” rule is a preferential rule for DRS and DPM and expresses a preference. DRS and DPM use their best effort to try to confine or prevent the virtual machines from running on the ESX host they are affined to, but DRS and DPM can violate “should” rules if it compromises certain key operations, HA is not aware of preferential rules because DRS will not communicate these rules to HA. Due its limiting behavior, it is recommended to use mandatory rules sparingly and only for specific cases, such as licensing requirements. Preferential rules can be used to meet availability requirements such as separating virtual machines between blade centers. If a reservation is set on the virtual machine, DRS takes both reservation and mandatory affinity rule into account. Both requirements must be satisfied during placement or power on. If DRS is unable to honor either one of the requirements the virtual machine is not powered on or migrated to the proposed destination host. For example if a new rule is created and the current virtual machine placement is in violation of the rule, it can only migrate to a new host if the virtual machine memory reservation can be satisfied on the new host, if this is not possible, DRS will not generate the recommendation. If a rule is created that conflict with another active, the older rule overrules the newer rule and DRS will disable the new rule. As you can imagine that mandatory affinity rules can complicate troubleshooting in certain scenarios for example, why a virtual machine is not migrated from a highly utilized host to an alternative lightly utilized host in the cluster. DPM does not place an ESX host into standby mode if it will violate the mandatory rule and will power-on ESX hosts if these are needed to meet the requirements of the mandatory riles. Due to the DRS-HA integration in vSphere 4.1, HA respects mandatory (must) rules. During an ESX host failure event, HA ask DRS to supply the list of hosts and places the virtual machines only on the compatible host, i.e. the host that are allowed by the mandatory rules. HA is unaware of the preferential (should) rules, so HA might unknowingly violate the rule during placement of virtual machines after an ESX failure, but the violation will be corrected by the next DRS invocation. Let’s take a look at a configuration which I think is going to be widely implemented soon, the Oracle Must affinity rule. In this scenario, DRS never places, migrates, or recommend placement of a host-affined virtual machine on a host to which is not listed in the Cluster Host DRS Group (ESX01 – ESX06 & ESX09-ESX14). This means that DRS will never ever place the virtual machine on an unlicensed host, not for maintenance mode, not for DPM power saving and not after an ESX host failure event. This virtual machine to host affinity rule make it possible to run oracle inside big clusters without having to license all the ESX host. I have been involved in a few projects where Oracle license was a constraint. Normally separate smaller clusters were deployed for Oracle database virtual machines, increasing both OPEX and CAPEX of the environment. These rules allows the Oracle virtual machines to run inside the cluster with other virtual machines without having to license all the ESX host inside the cluster. Hereby making the lives easier of both the architect and the administrator. vSphere 4.1, you gotta love it! No, I haven’t checked, but in theory you will need to license every ESX host in your vCenter datacenter, because that is the vmotion boundary. You are able to place a virtual machine on any ESX host inside your vCenter datacenter. But lets focus on VM-host affinity rules. If a host is in a VM-host must affinity rule, they are considered compatible hosts, all the others are tagged as incompatible hosts. DRS, DPM and HA are unable to place the virtual machines on incompatible hosts. Due to the incompatible host designation, the mandatory VM-Host is a feature what can be (undeniably) described as hard partioning. You cannot place and run a VM on incompatible host. Good read, thanks. Looks to me this would also be useful for those of us with limited budgets & EVC clusters who’d like to more-easily keep certain VMs on the more powerful CPUs. Frank, thanks, there might be some hope in this. With this new feature, where does that put the use of stretched clusters(i.e. having one cluster stretched across multiple sites)? It was my understanding that this was previously unsupported as DRS/HA was not ‘site aware’…now you can just restrict groups of VM’s to hosts in one datacenter(or more if necessary) so they’re not vMotioning across the WAN during the day. If stretched clusters are now supported, where do you think that puts SRM? Say you have a 5 server cluster with 80% utilization. One server fails and HA restarts the guests, unaware of affinity rules. I can imagine a situation in which DRS would be unable to recover to your preferred affinity state. Great Post Frank! Was thinking of writing up the same thing, but you beat me to the punch. I’ve been talking to my enterprise clients for months now about how they could use Host Affinity Rules. I shared a few of these use cases over on my blog as well. Frank, thank you very much for publishing this great post. In our environment we have a stretched cluster between two buildings half a mile apart, storage is fibre channel stretched between sites. I created a new host group for site a and another one for site b. Cluster nodes which need to run on seperate sites to protect the services against a site power failure are added in relevant vm groups. DRS anti-affinity rule is created with a must run rule which satisfies my requirement. Very similar setup to your Oracle example. Nick: SRM will be required where you do not have a shared storage between your sites. SRM is a Disaster Recovery tool where stretched clusters may be referred as Business Continuity suites. If you have the bandwith for your SAN or NAS in your stretched cluster, consider v-motion recommendations and limitations. Unfortunately Oracle does not see vmware as a valid hard partitioning technology at all. Those are their exact words. At this point in time even if you use the new virtual machine to host affinity rule they still do not recognize this – I just got off the phone with our rep. Their stance is that until they can figure out a good way to audit things, they can’t recognize it. You either need a separate cluster for your oracle boxes or you need to license ALL the sockets in your original cluster. Great post Frank, very informative. Out of curiosity, how long does it take DRS start to apply the prerferential rule after an HA event such as host failure has occurred? Beside Oracle, any other ISV that is charging for the _entire_ cluster? I wonder if any legal department in large enterprise has reviewed Oracle licensing policy. IANAL, but it looks grey to me when it comes to this new affinity rule. Separately, what if DRS is disable at the cluster level. So it’s just a simple HA. Does Oracle still charge for entire cluster, so it’s down to 1 host? With DRS turned off, and thus, no affinity rules, is there any way to know (or to control) which host will be my rescued VMs transferred to in case one host fails?? I need to make sure 2 VMs won’t be on the same host in case one of the host fails! I must keep them on separate hosts. Is this possible? ?